When a commercial kitchen needs perfect rice, they count on the proven performance of the Proctor-Silex 37560R Rice Cooker / Warmer. The exterior housing is made of durable insulated double wall stainless steel for the rigors of commercial use. The interior non-stick cooking pot is removable, easy to clean and has visible water line markings to assist in accurate measuring. Suitable for various types of rice, the rice cooker can also cook macaroni & cheese, porridge, grits, grains and quinoa. 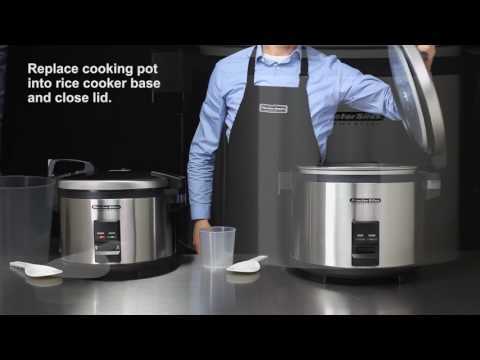 The rice cooker automatically shifts to warm mode after the cooking process is complete for easy one touch operation. Serving and cleanup are a breeze with the heated, hinged locking outer lid, detachable inner lid and condensation collection cup. The rice cooker / warmer comes standard with a plastic measuring cup and rice paddle. This product measures at 15.4 inches tall with an 18.1 inch diameter and holds 60 cups of cooked rice. NSF, 120/60/1, 1550 Watts, 12.9 Amps, CE, ETL, NEMA 5-15P.